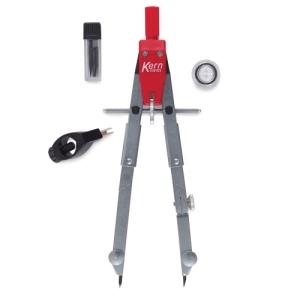 Fine-quality Kern Jointed Bow Compasses are made in Italy. They feature all-brass construction, nickel-glazed legs, and a cool gray and red finish. Articulated 6½" (17 cm) legs include double-friction knee joints, an adjustable needle (with disk to protect paper), and universal adapter. Choose the base model or model with extension bar.